I tried a new class at the gym on Thursday night! It was a free demo of TRX Core. While the class was only 20 minutes long, it was intense and I was sweating by the time I walked out of there! I was the only new person and the teacher was really good at showing the beginner exercise vs. the experienced. I started with the beginner exercises and then attempted to do the more advanced ones when possible. I struggled most with keeping my feet in the straps during the plank position exercises and it hurt the ankle I had surgery on a little bit. I most enjoyed the exercises we did while standing and holding on to the straps. However, I know that the plank position exercises were great for building my upper body strength and core. The day after, I felt a little sore, mostly in one of my arms and just a tiny bit in my core. The class includes a fee, which is only $25 for a month of Tuesday/Thursday classes for members and $40 for a community participant. The TRX training website offers a lot of information and visuals of exercises. If you are lucky enough to be able to workout with a TRX system of your own at home or at the gym, check it out for inspiration. Have you ever tried TRX exercises? 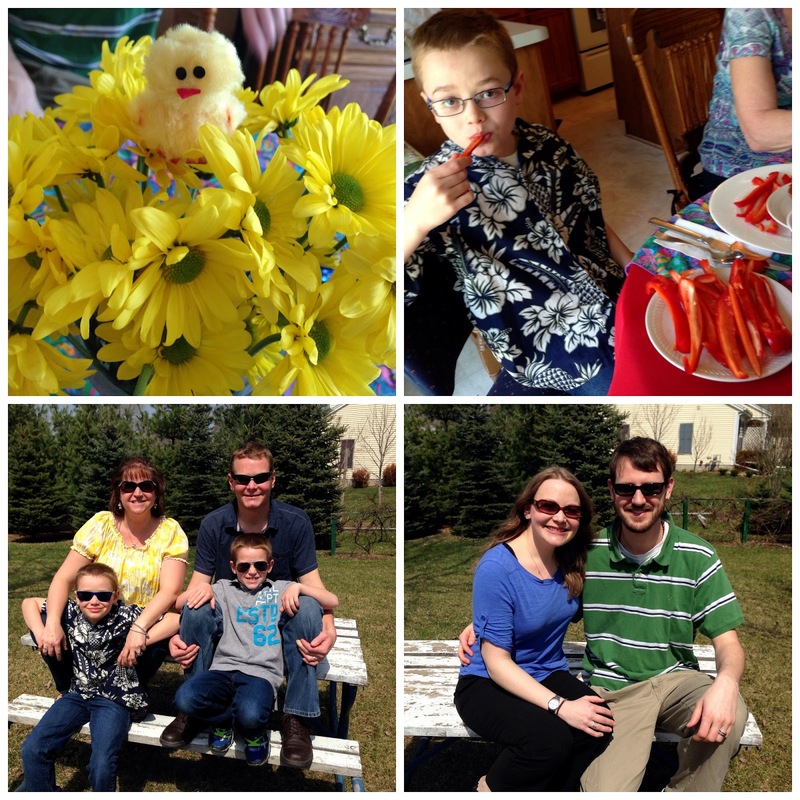 It was a gorgeous Easter day! The high was 80 degrees near my parents' house! 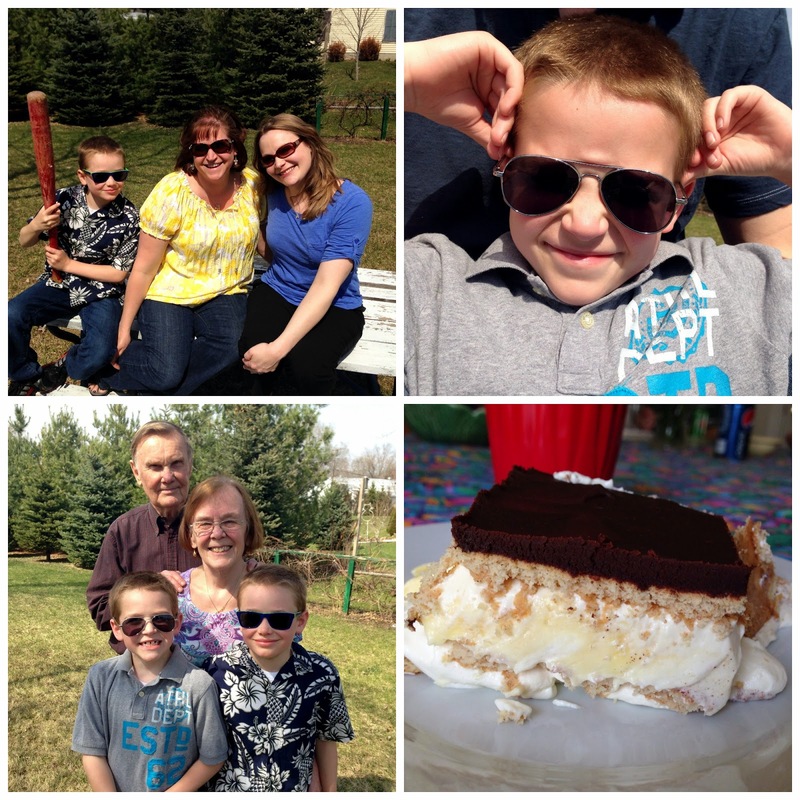 We had lunch and then got outside to enjoy the warm weather. Like most kids, my nephew Nathan is a picky eater and he's on a red pepper kick. For the record, he did not eat all of those peppers, but I think he thought he would! Dessert was Napoleon cake, which is delicious! I even swung a baseball bat and had so much fun doing it. It's been about 10 years since I did that! How was your holiday (if you celebrate)? I coordinated a lecture about the aging brain at work recently and learned a few tips to share about keeping your brain healthy. My mom and her friend were also in the audience and I was glad to hear that my mom already practices many of the suggestions listed below. Eat right!--this includes dark chocolate and a glass of wine on occasion. The Mediterranean diet is often mentioned as being beneficial. Exercise--this is the most beneficial thing you can do! Make sure you get 30 minutes of exercise each day. Social interaction--people who actively engage in social situations are likely to live seven years longer than others. 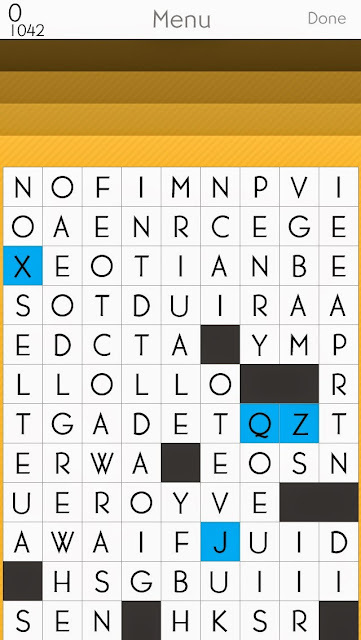 My favorite word game, SpellTower. She also mentioned traveling (even locally, like going to a town you've never been to before); learning different languages; challenging your assumptions; keep doing different things, etc. Are you concerned about your brain health? Even though I pride myself in having a really good memory now and do many of the things listed above, I still worry about Alzheimer's affecting me someday. It's been a while since I made homemade sushi, so I jumped at the chance to write a post about an Asian recipe paired with Kirin Ichiban beer. I had never tried Kirin beer before and I enjoyed the light variety with vegetarian sushi. I could also see it pairing well with a stir fry or tofu with noodles and vegetables. Kirin is one of Japan's oldest breweries and it was started in 1888. The Kirin Beast (one-half dragon, the other deer) on the label is thought to be a good omen of serenity and prosperity. In Japan, it is customary to never fill your own glass and never let another's glass get completely empty! When everyone is ready to drink, they salute with "kanpai. Kirin Ichiban is a 100-percent malt, first-press beer with rich flavor, a smooth finish and clean aftertaste. It pairs well with traditional Japanese and modern Asian cuisine. It's unique because it only uses the first strain of malt liquid. 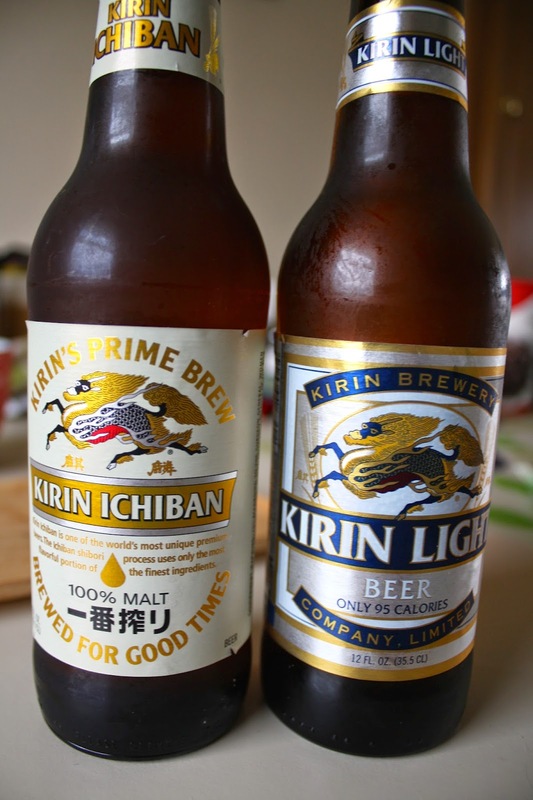 Kirin Light offers full flavor and authentic Japanese-style beer and a bottle is only 95 calories. 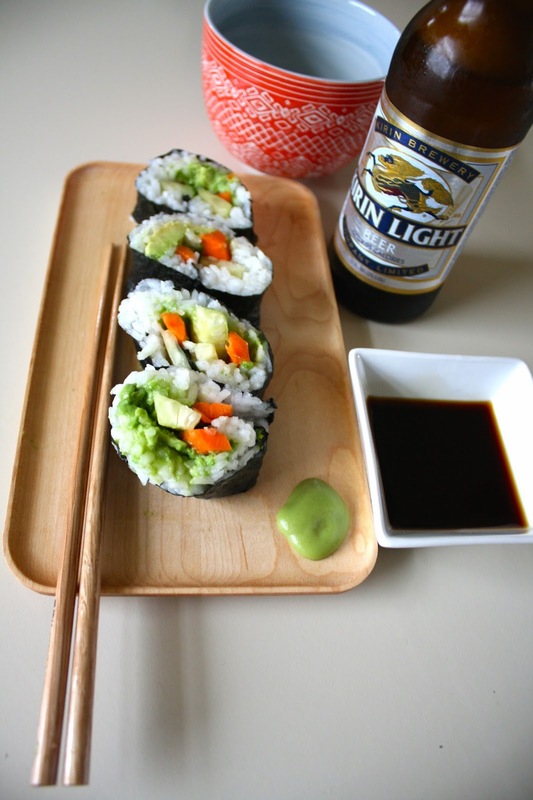 Since it pairs well with healthier Asian dishes, I chose to try the Kirin Light with the sushi. I was provided the sushi rice and nori seaweed, so I just added avocado, cucumber and carrots and rolled them up! Kirin has partnered with celebrity chef, Candice Kumai, to bring Japanese-style beer to the growing Asian cuisine movement. The clean and pure taste of Kirin is a wonderful complement to refined traditional Japanese cuisine and the bolder flavors of modern Asian food. If you're interested in checking out special recipes throughout the year, Kumai will share recipes and pairing tips on Kirin's Facebook page. If you've never tried Kirin beer before, I would highly recommend it! Thank you to Millenial Central and Kirin for this opportunity! 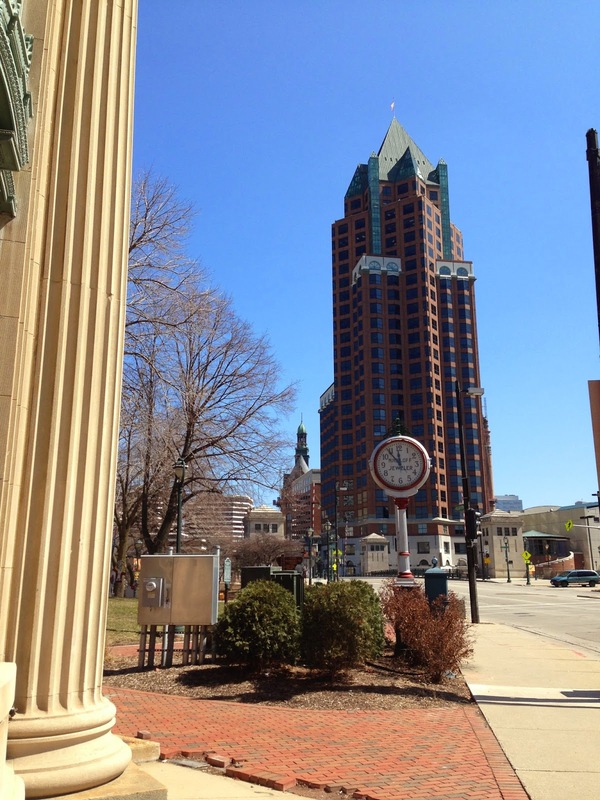 It's been a long time since I did a Five Things Friday post. 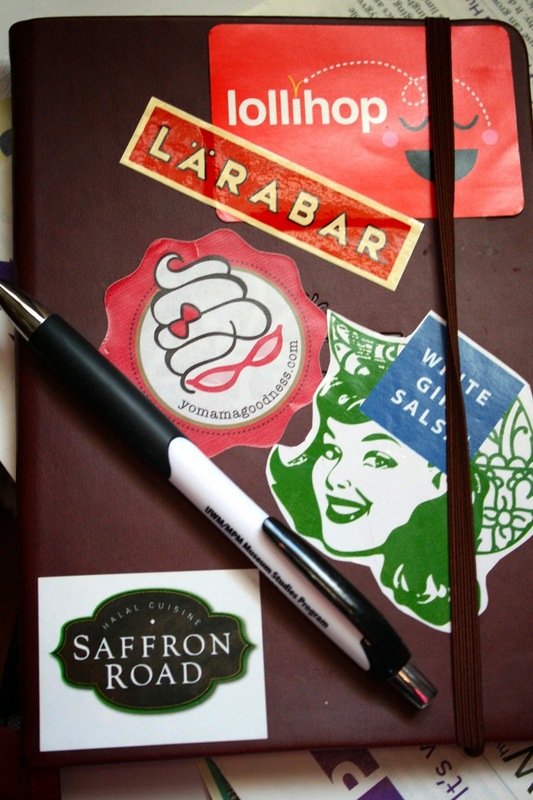 I think my gratitude journal is helping me keep better track of things I am thankful for lately! 1. Blog: I recently finished reading the book "How to Be Danish." My great-grandmother was Danish and their country fascinates me (mostly because of the happiness lists they appear on). While the book itself wasn't as good as I expected it to be, a cool blog was mentioned in it. It's called Cycle Chic and features photos of very stylish and pretty people biking in Copenhagen. I fantasize about being able to bike to work in stylish clothes and still look good once I get there. 2. Pampering: I got my haircut last week and while I am growing it out, I really need it cut more regularly to get the "bulk" out. I am having a massage this morning before going into work later in the day. I have been really sore from my workouts this week, so I am sure the massage will feel great. 3. Song: Wild Cub's Thunder Clatter. 4. 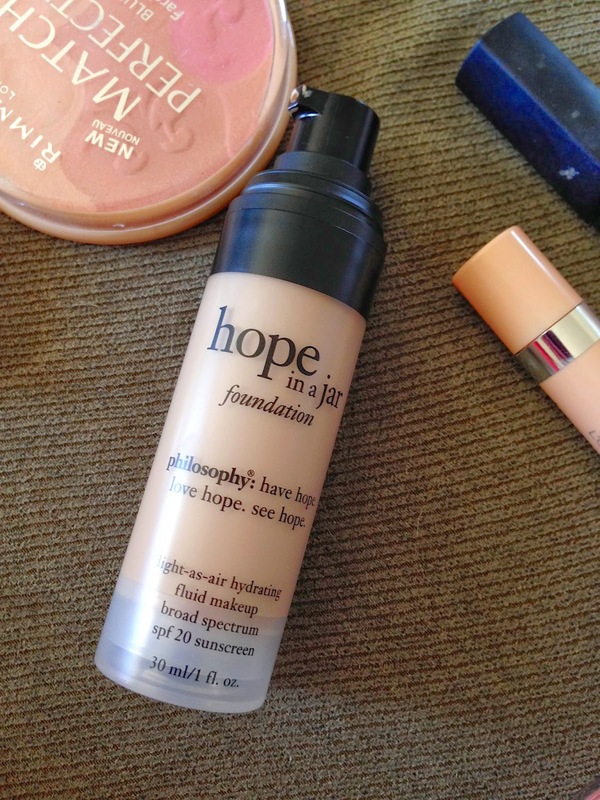 Beauty product: Hope in a Jar foundation from philosophy. The Makeup Forever foundation I purchased last month is going back to Sephora (thank god for such a great return policy). The Hope in a Jar one suits my coloring and skin type so much better. 5. 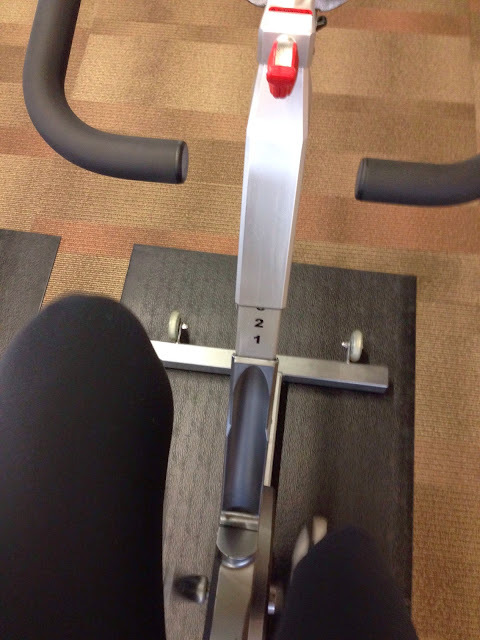 Exercise: While I've been loving the gym again lately, I truly enjoy exercising outdoors. I especially love lunch time walks and strolls around the neighborhood with Craig. My workplace offered a stress management information session last week and I thought I would share a bit about what I learned. He suggested a couple of techniques to implement the above guidelines, including writing three things you are grateful for in a paper journal every single night before going to bed. I’ve been doing that since Thursday and it’s been fun to pick out the three things that made me happy that day.